" THE THRILL OF REEL FILM"
Hundreds of Second Hand Films In Stock. Including: Trailers, 200, 400, 600, 800 Versions, Full Length Feature Films, Special Super 8mm & Standard 8mm Edited Versions Of Feature Films. Home Movies & More. Projectors, Cine Cameras, Editors, Splicers, Editor Accessories - Sound Heads, Film Cleaners, Frame Counters. Titlers. Magnetic Sound Stripping. Equipment Hire. Super 8mm Tri-X, Plus-X, Vision3 50D, Vision3 200T, Vision3 500T, TOFC 40 Sound, Vintachrome 160T Sound, TOFC P51, VintaVision, Ektachrome 64T, Ektachrome 100D, Process Paid Packages, 4in1 Specials. Double 8 (Standard 8mm) TOFC RX-100 Process Paid, 4in1. Standard 8mm, Super 8mm, 9.5mm, Dual 8 Spools. Spool Adapters, Film Clips, Boxes. A selection of the vast amount of lamps we have in stock. If we haven't got your lamp in stock please email us your required lamp and no matter how rare we are confident we'll be able to source your lamp and we'll get back to you with a quote. For many discounts, exclusive stock, film lists and special offers for subscribers only. Enjoy the benefits now. Click above to find out how. The fast & easy way to pay on some stock items. Show the world your love for Super 8mm with various items of clothing, bags, badges, caps and many other items. Celebs photographed with cine cameras & projectors, including my personal favourites, the greatest Pin-Up of all time Bettie Page and the multi talented Katy Perry. 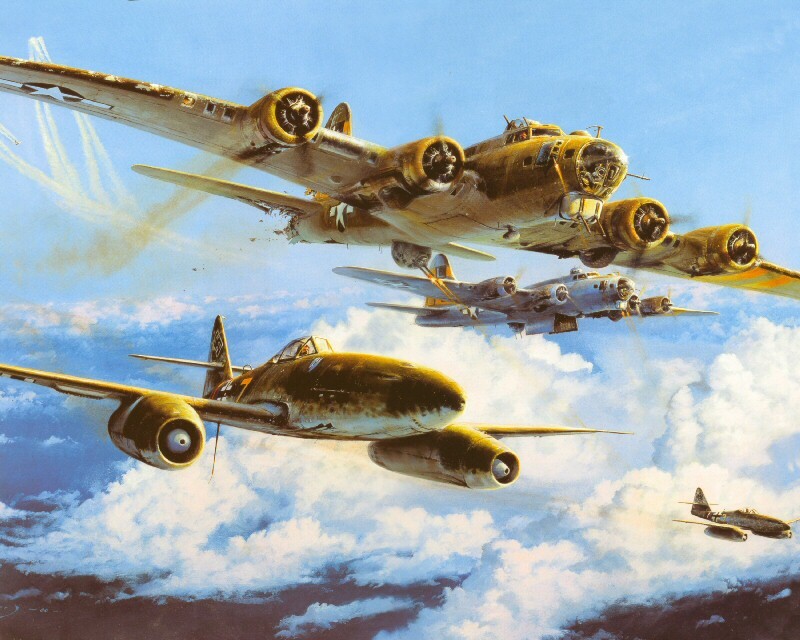 Now is your chance to own a quality 12.5" x 10.5" print of a truly wonderful Oil Painting of the mighty B-17 in combat with the ME262 over the Reich during 1945. Please Note: This is a print purchased from the U.K. on 125gsm paper and not something, which has been scanned and printed on someone�s home computer, as so often is the case. To purchase the item on this page simply email the country of destination and name of the item using the link below if you use standalone email software such as Outlook etc. Or you can send a email to rik@theoldfilmcompany.com if you use web based email. Or you can submit your order using the form at the bottom of this webpage. On receiving your order your be sent a PayPal Electronic Email Invoice to your email address within 24 hours for fast easy secure payment. P&P to a U.K. address is just �3.00 regardless of order size. All major credit or Debit Cards are accepted. We aim to dispatch within 24hrs of payment received. Or you can send a cheque using the Order Form which can be downloaded from the Home page.